Shailesh Patel joined InnoMedia in January 1999 as the director of testing and support and has since been promoted to senior director, broadband product management, testing and support. He manages broadband product management functions, as well as the testing, technical support and systems engineering for InnoMedia’s broadband and Internet telephony products. Patel boasts an extensive foundation in testing and support, having served as system test manager for Diva Communications from 1995 to 1998. At Diva Communications, he managed the testing and training for the company’s Wireless Local Loop system. Patel has also conducted product testing for Siemens Rolm Communications from 1987 to 1995. 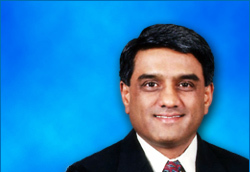 Patel’s experience also includes his involvement with product planning for next generation computer systems at AT&T Information Systems. He also served as member of technical staff at AT&T Bell Labs, developing software and testing the Advanced Mobile Phone Systems (AMPS) cellular system. Patel holds an M.S. in Computer Science from Stevens Institute of Technology. He also earned an M.B.A. in Marketing from Illinois Benedictine College and a B.S. in Engineering from University of Baroda, India.